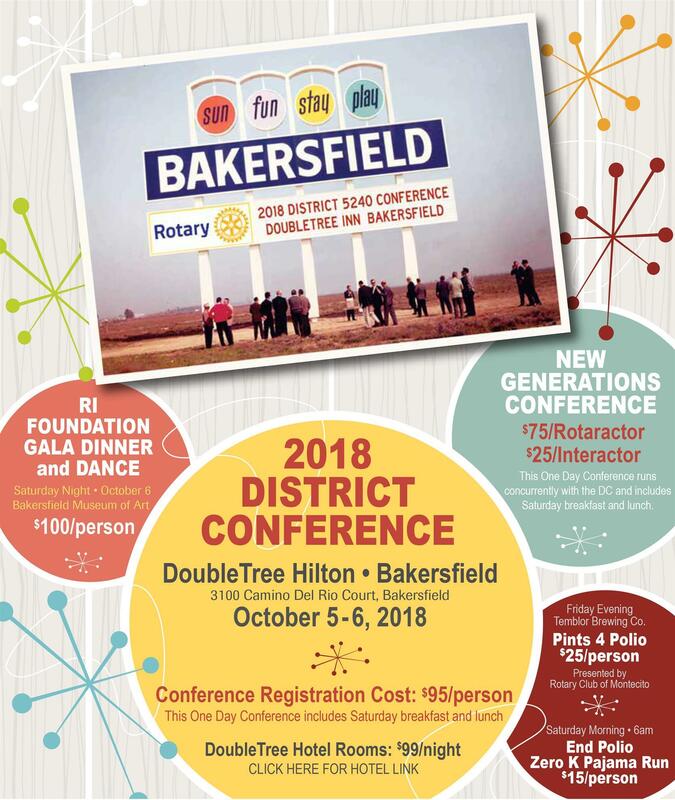 Have you registered for the 2018 District 5240 Conference in Bakersfield yet? If not, time is running out! The conference will be held October 5-6, 2018, at the DoubleTree by Hilton in Bakersfield. Reserve your room at the conference hotel by SEPTEMBER 10th to get the special convention rate of $99 per night. Human trafficking is a criminal enterprise active in our district. You as an individual, your club, and our District can bring together organizations and local governments to stop human trafficking. Rotary is prepared to take on this challenge, so join us and learn what you can do. Can we successfully wage peace? Find out from someone who is literally on the front line. Hear how we can progress towards peace and be a key participant in moving this Rotary Focus Area forward. Rotarians around the world are steadfastly united in the effort to eradicate polio. Join us at the conference and together we’ll raise a glass at Temblor Brewing Company toward the elimination of this deadly disease. We are not done eradicating this horrible disease and we won’t rest until we are done. Take a very short, fun walk and have a pajama party with DG Sandi. Earn some pastries, coffee, and share a fun morning with your fellow Rotarians. Get “In the Mood to Inspire” at the Rotary Foundation Gala with an al fresco dinner and dance to the big band sound of Foster Campbell and Friends. Project exposition and vendor fair. The Conference will provide you with actionable ideas and new friends to make the world a better place. There are opportunities to be recognized as a sponsor throughout the entire conference.